Iron Bow’s managed service offerings, IronCare™, provide our clients with enterprise technical support, remote monitoring, management and maintenance of technology solutions and systems, enabling agencies and organizations to stay focused on their core mission. IronCare coverage is provided by our U.S.-based 24/7/365 Client Service Center (CSC) team in Chantilly, Virginia and Tampa, Florida. 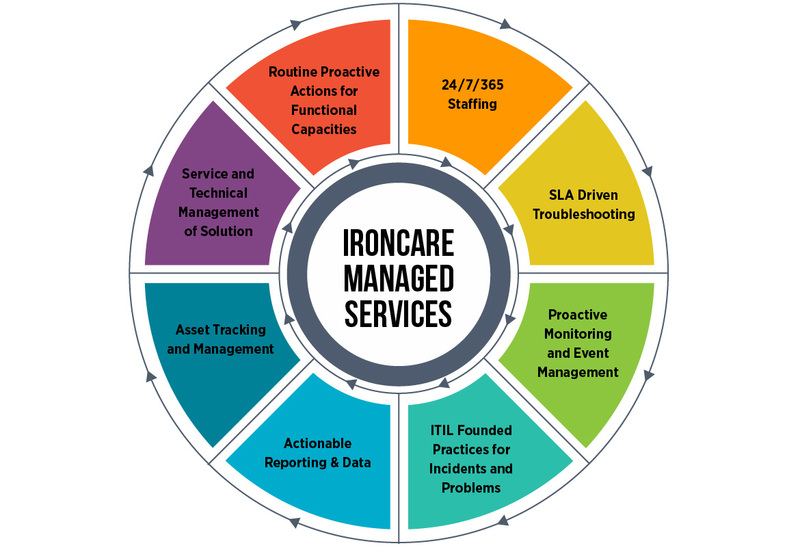 IronCare service methodologies are based on Information Technology Infrastructure Library (ITIL) best practices, ensuring the highest level of support for our clients’ IT environments 24/7/365. IronCare Managed Wireless – Wi-Fi connections are mission critical in every organization for both daily work and guest networks. Ensuring that wireless equipment is available, connectivity remains consistent and capacity is ready to support increasing enterprise requirements is a continuous effort. IronCare Managed Wireless provides a comprehensive solution for wireless networks to ensure availability, performance and scalability to meet day-to-day and future demands. IronCare Managed Networking – With today’s networks stretching beyond the enterprise to incorporate mobile, cloud and IoT, IT teams need a broader base of expertise to manage the diverse technology sets. IronCare Managed Network maintains these environments through a including campus environments, software defined networking, fabric switching and traditional LAN/WAN. IronCare Managed SD-WAN – With distributed networks, public and private clouds and enhanced focus on connectivity, software defined WAN has enabled enterprises to optimize traffic, improve cost and implement redundancy through WAN technology. IronCare Managed SD-WAN assumes responsibility for handling the end-to-end monitoring and management of these policies, accessibility and connectivity availability, ensuring a high performing WAN environment. IronCare Device as a Service – Traditional device procurement creates a cycle that often results in outdated technical capabilities as well as technology and financial risk. IronCare Device as a Service (DaaS) streamlines device lifecycle management while optimizing device-related costs and reducing enterprise risk. IronCare DaaS moves the costs associated with devices from capex to a predictable opex model. IronCare Infrastructure as a Service – With the adoption of public cloud, enterprises have seen the benefits of being able to consume infrastructure rather than acquire it. However, public cloud is not always the best option. IronCare infrastructure as a Service allows organizations to consume on-premise infrastructure in a pay-as-you-grow model. IronCare Managed Unified Communications – As remote work, dispersed teams and 24/7 connectivity are now the norm, organizations have adopted modern unified communications (UC) solutions that bring new capabilities to the workforce. IronCare Managed UC draws on our rich legacy of designing, deploying and managing UC solutions to ensure your teams stay connected. IronCare Managed Telehealth – Telehealth solutions utilize complex technologies and specific customer workflows. For telehealth program success, patients and providers require the technologies to always perform as expected. IronCare Managed Telehealth understands these workflows, and the critical nature of healthcare environments. The Iron Bow team streamlines the deployment and management of telehealth solutions while optimizing device-related costs and reducing enterprise risk. IronCare Partner Support Services – IronCare PSS delivers maintenance support services on Cisco devices. With IronCare PSS you receive the same expertise, response SLAs and warranty support as you would from Cisco SmartNet with the addition of our U.S.-based team’s intimate knowledge of your supported components. Iron Bow’s Hosted Collaboration Solution for Government (HCS-G), powered by Cisco, provides cloud-based unified communication and collaboration applications within a highly secure, FedRAMP compliant platform, to federal agencies and security focused commercial enterprises. This solution meets federal cloud mandates, reduces costs and easily connects end users on any device, resulting in reduced IT complexity for your agency. HCS-G is easily scaled to the size of your agency – this flexible solution is your cost effective and secure answer to accelerated adoption of cloud services. Iron Bow Technologies manages over 20,000 telehealth assets for a federal healthcare provider. The IronCare service gives the client a single number to call for IT support versus multiple numbers depending on the technology. Our staff, skilled in the technology and knowledgeable about the environment, quickly assess the situation, reduce the troubleshooting time and provide the client a timely resolution. This support allows the client to get the most out of their telehealth investment, realizing productivity and patient outcomes without adding to the workload of IT or adding complexity to technology systems and processes. A state agency needed to implement a new IT Infrastructure Services program to better serve its customers across the state government. The goal of the program was to maintain and improve service quality, be cost effective, offer a wider menu of services and have a platform view of this service delivery for improved visibility and accountability. Iron Bow implemented a Device as a Service program that encompasses the full lifecycle of device use from acquisition to deployment to management and maintenance including field service and ongoing software support. Iron Bow serves as the single point of contact for all devices deployed and provides the client a real time view of consumption, cost, performance and the responsiveness of suppliers. This program is in the early stages, but is designed to provide cost and time savings for the client. Iron Bow monitors and manages the unified communication systems for a federal agency. Prior to its partnership with Iron Bow, the client’s phone system at the D.C. main campus and 37 remote sites was supported by in-house resources. The client was looking for a partner that could utilize the hardware and software they had in place as well as hardware and software currently owned, but not in operation. The Iron Bow solution was implemented on-premise with redundancy at two locations. Moving forward, the IronCare Managed Unified Communications service has Iron Bow being responsible for ongoing management of the unified communications technology that includes approximately 170 endpoints on a 24X7 basis. Iron Bow manages 84 CLINiC consultation devices for a non-profit health system made up of 151 hospitals and 2,600+ sites of care. This support streamlines the deployment and management of this modern solution while optimizing device-related costs and reducing enterprise risk. The Iron Bow team provides 24/7/365 phone support for usage questions, troubleshooting, active monitoring and notification of patching updates. The service also includes asset management, configuration management and preventative maintenance. Iron Bow deployed a guest wireless network for a military health provider across multiple field offices. The client needed the network to be fully managed for ongoing support and maintenance so that the internal IT team could focus on the network used by staff. With guest wireless, patients and visitors now have reliable access to online resources provided by the hospital. The network is proactively managed by Iron Bow and the client’s IT team has a single point of contact should any issues arise. A growing consultancy was moving out of a shared office space and into its own office. The company needed to support employees in the new office as well as employees working on client sites. Iron Bow took on the management of the company’s network to include all Local Area Network infrastructure such as routing, switching and virtualization platforms. Iron Bow also managed third party and carrier relationships on behalf of the client. The Iron Bow team provided remote monitoring, critical patch updates and remote technical support as well as placing a technician in the office for any needed on-site support. Our experts have the niche expertise needed to keep systems performing at the highest levels. With consumption pricing and a number of service level options, we work with you to provide the support needed. Technology will meet and exceed needs while supporting mission and goals.